However, the handset, expected to be called the 6s and the 6s Plus, they will have a radical overhaul internally - and a new pressure sensitive screen. 9to5Mac claims these images are the first of the phone, which is expected to be unveiled in September and go on sale soon after. 'For fall 2015, Apple is preparing an 'S' iPhone upgrade that superficially preserves the exterior designs of the iPhone 6 and iPhone 6 Plus, but includes a collection of major internal changes,' the site says. 'Apple Inc. has started early production of new iPhone models with a feature called Force Touch, which senses how hard users are pressing down on a screen,' people with knowledge of the matter told Bloomberg. According to Apple, 'In addition to recognizing touch, Apple Watch senses force, adding a new dimension to the user interface. 'Force Touch uses tiny electrodes around the flexible Retina display to distinguish between a light tap and a deep press, and trigger instant access to a range of contextually specific controls. 'With Force Touch, pressing firmly on the screen brings up additional controls in apps like Messages, Music, and Calendar. 'It also lets you select different watch faces, pause or end a workout, search an address in Maps, and more. Force Touch is the most significant new sensing capability since Multi‑Touch. According to Bloomberg, the newest iPhone's, in the same 4.7-inch and 5.5-inch versions as the current iPhone 6 and iPhone 6 Plus devices, will have a similar exterior design, the people said. Volume manufacturing is scheduled to ramp up as soon as next month, they said. The technology could also eventually allow Apple to kill off the home button. Instead of a button, fingerprint sensors would be built into the screen to allow the firm#s Touch ID system to work. 'Apple is internally developing touch and display driver integration (TDDI) single-chip solutions for its iPhones, according to sources in Taiwan's IC design industry,' claimed DigiTimes. The TDDI single-chip solutions will also come with integrated fingerprint sensors, said the sources. 'The integrated design would fit into future iPhone designs – models with ultra-thin and ultra-narrow displays, and with a whole plane design eliminating the Home button. According to AppleInsider, the new handset could appear in 2017. 'A source who in the past has correctly shared information about Apple's future product plans indicated on Monday that Apple is indeed planning on removing the home button from future iPhone hardware,' it said. The new handset could also mean selfies could soon be even sharper, if claims about Apple's next iPhone are confirmed. Experts analysed the recent test version of iOS 9 released by the firm - and founds hints of a big upgrade for the handset's front facing camera. 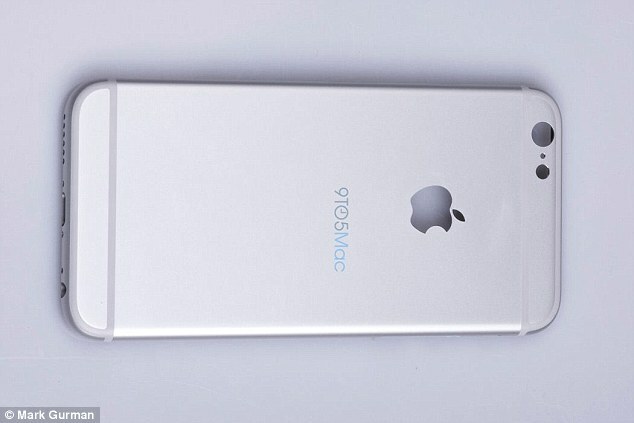 It reveals full HD video capabilities and a flash could be coming to the front of the next iPhone. Developer Hamza Sood has discovered code in iOS 9 that reveals support for changes to the front-facing FaceTime camera. Code in iOS 9 also hints at support for capturing 240fps video at 720p using the front facing FaceTime camera, Sood notes. The code include support for a front-facing camera flash — something Apple hasn't included on any previous iPhone — and the ability to capture panoramic selfie photos using the front camera. In an email to staff seen by Mobile News, the operator also outlined pre-launch information, including plans to begin taking pre-orders for the device from September 18. The email described the device as the 'New iPhone', suggesting Apple may look to follow its strategy with its iPads by not giving it a number. Several key features of the phone have already leaked. It's screen will know exactly how hard you are pressing it, and will have new 'smart' features to take advantage of that, it has been claimed. The system is already being used in the Apple Watch and the firm's new Macbook portable computer. The new iPhone, expected to be unveiled in September, is also expected to borrow the aluminium and rose gold used in apple's watch. Analyst Ming-Chi Kuo said he expects the new 4.7-inch and 5.5-inch iPhones to enter mass production in mid-to-late August, and does not believe that a new 4-inch iPhone model will be released in 2015. He says an upgraded screen will be the main selling point. 'Force Touch will be the biggest upgraded selling point, but also one of the main bottlenecks of the supply chain. 'Force Touch can enhance user experience due to more input methods and support of handwritten signatures, which is beneficial for expanding in the commercial market. The new technology could spawn new applications for the phones, such as a piano-playing app that would make different sounds when touched lightly or more heavily. Other predicted features for Apple's next iPhone include an A9 processor with 2GB of RAM, improved 12-megapixel camera. According to Kuo, the iPhone will also use the same materials at the Watch. 'There will be an additional casing colour, rose gold, matching the rose gold Apple Watch Edition,' he said. The force touch technology was first seen in the new Macbook, and it also used in the Apple Watch. 'MacBook also features the all-new Force Touch trackpad that brings a new dimension of interactivity to the Mac,' Apple said when it was introduced. Called force click, it even allows users to 'deep press', allowing them to see the dictionary definition of a word, or access a customisation menu on their Watch. 'The new trackpad features built-in force sensors that allow you to click anywhere and haptic feedback that provides a responsive and uniform feel. 'You can even customize the feel of the trackpad by changing the amount of pressure needed to register each click.